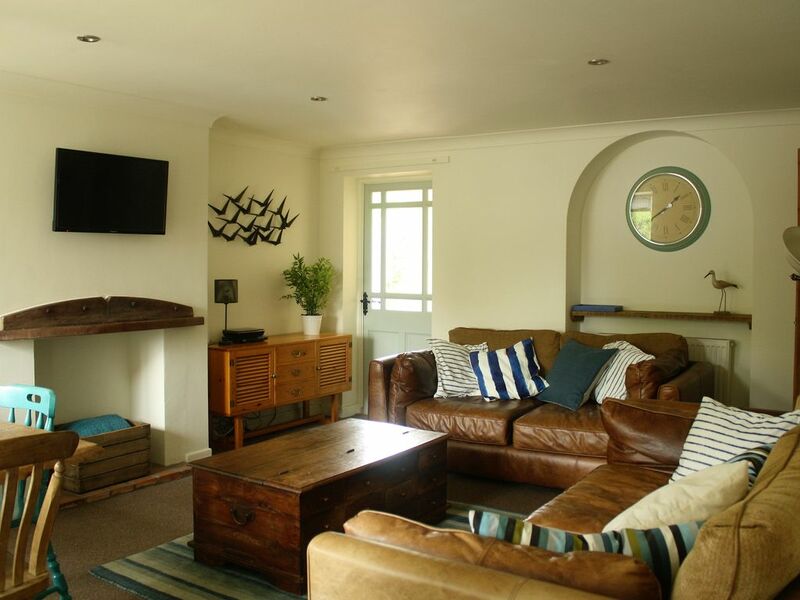 Nestled opposite, historic St Nicholas Church, the Mousetrap is a comfortably furnished barn conversion cottage, sleeping 6. Located behind the Quayside, the Mousetrap offers an easy 10 minute walk to the harbour, shops, pubs and cafes of this vibrant seaside town - voted the second best seaside resort in Britain by Holiday Which magazine. The Mousetrap is a single storey property at ground floor level, with walled courtyard and the added bonus of parking space for two cars. Making it ideal for a wide range of guests. Families looking for a summer holiday base, will appreciate the internal space and rear courtyard - outdoor hanging for those wet sandy towels and beach gear! Families with toddlers and older guests will appreciate the absence of stairs. The tiled entrance porch and plentiful coat hanging is convenient for winter bird watchers, who may come home a little windswept and damp after a wonderful day of wildlife spotting! Whilst cyclist exploring the Norfolk Coast Cycleway have a secure rear area to store cycles and other equipment. Beaches, walking, wildlife spotting, sports activities, visiting stately homes, arts & crafts, or simply chilling! Whatever your reason for visiting Wells and the wider North Norfolk coast the Mousetrap is a well equipped and superbly located holiday base. During 'High Season' (Mid July-Early Sep), Mousetrap only accepts full week bookings. At most other times we accept bookings for Long Weekends (Fri-Mon) and Mid Week Breaks (Mon-Fri) with a three night minimum stay. It's my intention to make the Mousetrap the best holiday home it can be, so that every guest who books with us will want to return. I worked in the hospitality industry for many years and apply my knowledge to make the Mousetrap a clean, comfortable, functional and attractive holiday home. I'm very mindful of the value of peoples holidays and breaks. Family holidays and leisure time spent with friends, should be wonderful and memorable. I want everyone to have a wonderful and memorable time in Wells next the Sea. I'm always happy to receive feedback from guests, as it helps me to continually improve the Mousetrap, fulfilling my goal of making it a great holiday home. The first time I visited Wells next the Sea with my family, I fell in love with the area. There is something special about the it's the quaint harbour and quayside, where tourists catching crabs, mingle with working fishing boats? Perhaps it's the 'big skies' and wide open, pine fringed forests. Or maybe it's the warm welcome you receive in all the pubs, cafes and restaurants - even when you're with your dog! Perhaps it's all these things and the enjoyment on kids faces, experiencing the freedom, they don't always get in a large city. You just have to come and experience it for yourself...I want the Mousetrap to be your home from home, while the magic of the place seeps into your soul! The Mousetrap has a number of benefits over other central Wells holiday properties - especially space and car parking. It's great being able to walk to the quayside in just a few minutes, whether it's for dinner in one of the many pubs and cafes, or just to buy a loaf of home baked bread from the High street bakery. Our enclosed courtyard allows days on the beach to be extended - have a bbq, or just relax in the evening sun with a glass of wine. If you're visiting Wells for sports or other leisure activities, it provides an area to hang wetsuits, store bikes, or just the buckets, spades and other stuff of a family beach day? Booking price includes bed linen: bottom sheet (and liner), continental quilt and cover, 2 pillows per person and pillow cases. All linen is freshly laundered for each guests stay. 7Kg load automatic washing machine. An outdoor aeriel dryer is provided for drying any laundry. We also provide an iron and ironing board. Comfortable Living Room furniture for 6 people, including wall mounted TV, FreeSat and DVDplayer. All the utensils you would need for cooking a full 3 course meal for 6 people. Enough cutlery, crockery and tableware for a meal for 6 people. Dining table and seating for 6. Seating is configured as a pew for 2 and 4 separate dining chairs. Child's high chair provided upon request. If parking in town - must use lock provided. Any punctures should be repaired. Bicycle used at guests own risk. Great cottage in lovely location. Really enjoyable stay. We stayed at the Mousetrap for 4 nights. I wish we had more time to spend there as our stay was so lovely. The house is fantastic, well equipped, very cosy, spacious, quiet, well located and we really felt like at home. Location is great as everything you need is in walking distance. Some great pubs around the corner! And North Norfolk is just beautiful. We had some questions before our stay and the Carl was really helpful and responsive. Overall, we couldn't have wished for more - fantastic stay! Everything we need from a holiday home- clean, good beds, great location and everything worked. Thanks for the review and feedback you provided. We agree, Wells next the Sea is a wonderful place for a break in North Norfolk. We're glad you chose the Mousetrap as your base and enjoyed your stay. We hope to see you again in the future. The Mousetrap offers a super holiday base to explore and experience Wells next the Sea and the wider North Norfolk Coast. Nestled opposite, historic St. Nicholas Church and centrally located behind the Quayside, The Mousetrap offers an easy 10 minute walk to the harbour, shops, pubs and cafes of this vibrant seaside town – voted the second best seaside resort in Britain by Holiday Which magazine. The town has a maze of narrow streets, old alleys and yards, filled with shops, pubs and cafes and there are many listed and impressive Georgian and Victorian buildings. A Co-Op supermarket is 100 metres walk through the church yard and for the evenings when you just can’t be bothered to cook, The Bowling Green pub is no more than 50 metres walk. They serve good pub food most evenings. There are a number of nationally important ‘stately homes’ in the area. Sandringham is the much-loved country retreat of Her Majesty The Queen, and has been the private home of four generations of British monarchs since 1862. The house, set in 24 hectares of stunning gardens, is perhaps the most famous stately home in Norfolk and is at the heart of the 8,000-hectare Sandringham Estate, 240 hectares of which make up the woodland and heath of the Country Park, open to the public free of charge every day of the year. During 'High Season' (school summer holidays) Mousetrap can only be rented for full weeks - changeover day is Saturday. Outside 'High Season' we also offer short breaks. Weekend Breaks = Friday to Monday Midweek Breaks = Monday to Friday Mousetrap can also be rented for full weeks Friday to Friday.